This is the first time we’re doing anything like this & we’re so excited to share it with you guys. 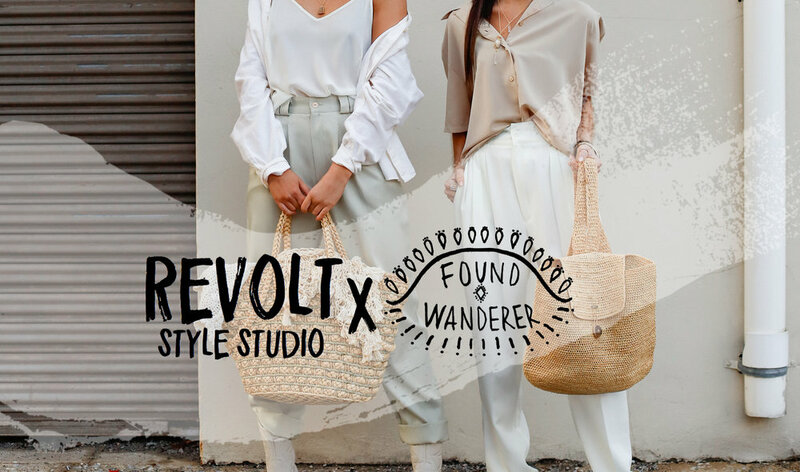 Introducing our first ever capsule collection Revolt Style Studio x Found Wanderer! Our first capsule collection is a collaboration, which makes it even better. We love collaborating with local business + creatives & this experience has been no exception. We have a few more collaborations scheduled for this year, so keep a look out for more collabs coming your way soon. Inspired by crystal energy and natural beauty, Found Wanderer is handmade jewelry made for the wandering, bohemian goddess. The theme of natural beauty lies at the soul and body of this brand. Launched in 2010 by founder, owner and designer, Kacey Royer, Found Wanderer is an independent jewelry label based in York, PA. Her obsession for crystals and background in communications has helped Kacey nurture her brand and watch it bloom to where it is today. Kacey spends her days working full time as an internet marketer. She dedicates her evenings and weekends to make her Found Wanderer pieces. Influenced by Found Wanderer’s beautiful bohemian jewelry, the vision of Kacey’s moodboard & the killer vibe of her Instagram feed, we were able to create a beautiful first ever capsule collection for Revolt Style Studio. Kacey was a dream to work with, from the amazing mood board she created & her raw + natural jewelry collection, to wonderful vibe she brought to the photo shoot! The collection focuses on textural, neutral tones, featuring separates + accessories, with a modern bohemian feel, highlighting the natural beauty of cottons, linens, & silks in earthy tones like ivory, cream, tan & rust. Believe it or not, we’ve been planning this collection since December! Kacey posted on Instagram last year that she was looking to grow her brand & collaborate with local creatives. Kacey has such a beautiful product & bohemian vibe that I immediately knew we had to make a collection together. After talking & planning for a few weeks, Kacey sent me a very inspiring mood board & I started shopping! Once all the pieces were selected, we used the images from the moodboard to inspire the photo shoot. We got to work with one of our favorite photographers, Brady Pappas, & enlisted Kelsi Hess to join Kacey in showing off the collection, featuring Kacey’s jewels of course!